Kenny Jackett revealed the hamstring injury suffered by Oli Hawkins is not as bad as initially feared. The former Dagenham & Redbridge player limped out of Pompey’s 1-0 victory against Plymouth Argyle at Fratton Park on Saturday. 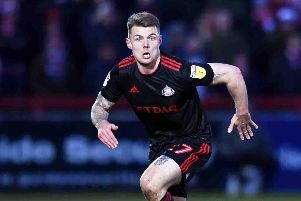 He pulled up in his own half in the 57th minute of the League One encounter and was replaced by Matty Kennedy two minutes later. Jackett did not want to take any risks with continuing with Hawkins, who was once again playing at centre-back. But the versatile talent’s injury is not a major concern for his boss. ‘He came off with a hamstring injury and didn’t seem too bad afterwards,’ Jackett said. ‘It seems better rather than worse but he had to come off.